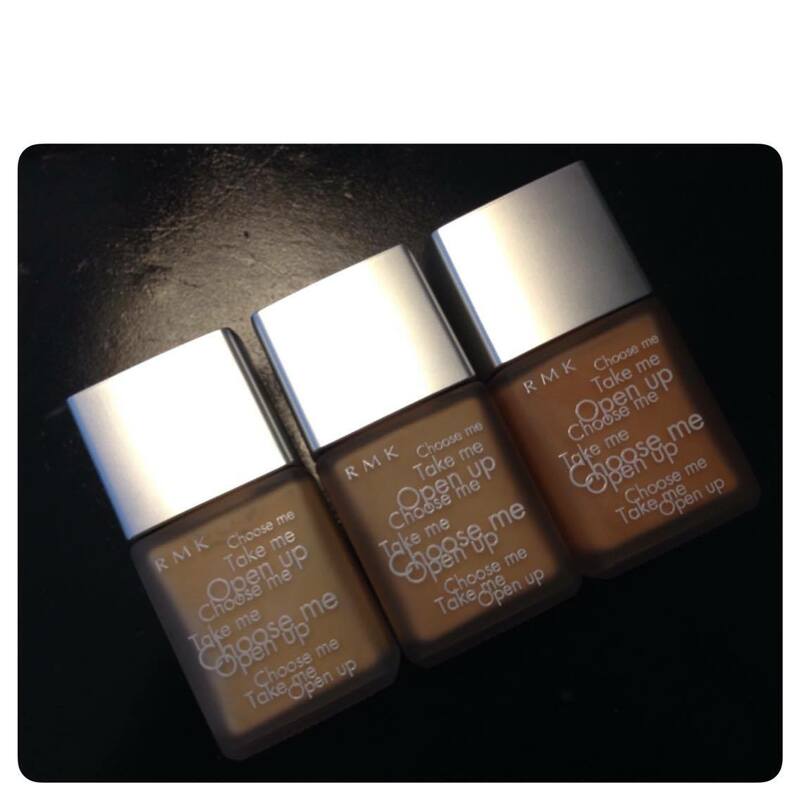 These foundations from RMK are a recent purchase. I first encountered this product when I was still starting out and I apprenticed for a well-known makeup artist in Manila. I have been wanting to buy them for years, but I was always turned off by the idea that it is not readily available in this country plus the fact that it’s not cheap. At 70 SGD, roughly Php 2380, is quite a lot of money especially when you are starting out. Last December, I decided that this coming New Year, I was to restock my kit with products that I adore and believe in. So one December afternoon, I called my Singapore based friend Neil and asked for his help. I told him to visit the RMK counter in Isetan Department Store and purchase a number of RMK products for me. So over Facetime, I pointed to the specific products I wanted to purchase while my darling friend Neil pirouetted around the RMK counter. I asked Neil to purchase three bottles of liquid foundations in the shades of 101, 103 and 105. 101 is the lightest of the color range, 103 is the median shade and 105 is the darkest. These have yellow undertones which is ideal for most Asian skin tones. You won’t get that beige-y “mask” look with these liquid foundations. There are five shades on this color range, but I only bought three because I can always mix the colors to get the “in between” shades. There are also three shades (201, 202 and 203) that are beige color range and the darkest shade (with red undertones) called Coffee Brown. Click here to be brought to their webpage to see the entire shades on both color range. What I like about this liquid foundation is that it looks like skin. Though it’s quite sheer, it is build-able to a medium coverage. It sits well on the skin and gives off a dewy finish which I LOVE. Mica Tuaño and I post makeup photo op. For a test run, I used this on a commercial shoot I did recently. I was very happy with the results and it’s staying power. 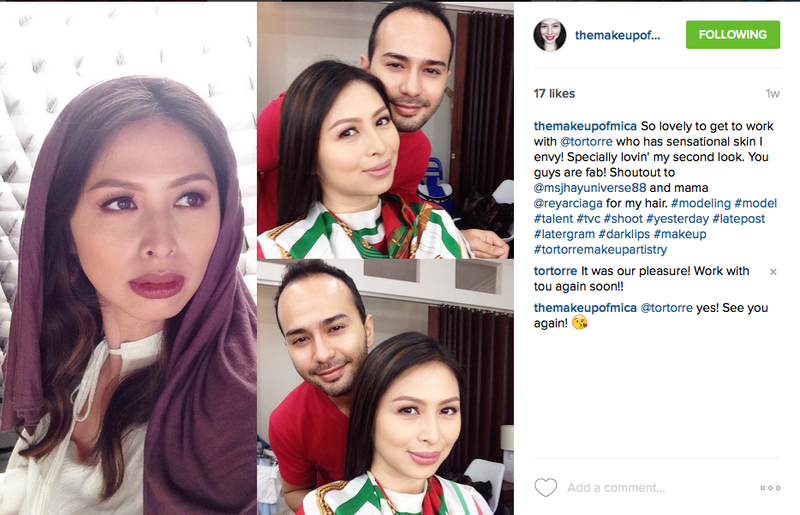 On the right, you can see how it looked like on my talent Mica (grabbed this photo from her Instagram page). I’ll post the video here once it’s airing. These foundations must be used in conjunction with their make-up base(click to see) to achieve ultimate results. I have observed that RMK‘s liquid foundations instantly diminishes redness and some other minimal skin discolorations with out looking cakey. This liquid foundation works well only on skin that has minimal blemishes. If you have lot’s of blemishes, a cream foundation should be used. This has an SPF of 14, so it’s good to use for those who are cautious about getting sunburned. Be wary of flashback though when using flash photography. Once Neil finished purchasing the RMK products that I wanted, all he had to do was to meet up with another good friend, Marco, who was heading back to Manila for the Christmas holidays. Finally after years of being undecided about this liquid foundation, I am happy that these liquid foundations have finally made it to my kit. To know more about RMK products visit https://www.rmkrmk.com/global/index.html. Click here to be brought to their branch index. RMK is a Japanese brand by Rumiko. It first opened shop in a department store in Ikebukuro in 1997. Since then it has started to slowly open up counters in Japan, Hong Kong, Taiwan, South Korea, Thailand , The United Kingdom, Malaysia and Singapore.